The Neanderthal metabolic patterns were different from the homo sapien patterns. Stress of the ice age led to the induction of heme oxygenase. Heme oxygenase converts heme to bilirubin and carbon monoxide. This results in heme depletion. Heme depletion induces ALA synthase and results in porphyrinogenesis. Porphyrin photooxidation results in ROS generation and induction of HIF alpha resulting in the Warburg phenotype with increased glycolysis, PDH inhibition and mitochondrial dysfunction. Heme depletion leads to defective function of the TCA cycle heme enzyme aconitase and the mitochondrial enzyme cytochrome C oxidase. This results in the body generating energy by glycolysis as well as membrane sodium potassium ATPase inhibition induced ATP synthesis. Mitochondrial dysfunction leads to insulin resistance. The global warming also produces oxidative stress and osmotic stress resulting in conversion of glucose to fructose. This results in increased fructose phosphorylation contributing to glycosaminoglycan synthesis, nucleic acid synthesis and lipogenesis. This contributes to a fat storage hibernatory syndrome which manifest as metabolic syndrome. The increased fructose phosphorylation and the cellular depletion of ATP can lead to cell death and neurodegeneration. Fructosylation of proteins leads to autoimmune disease with glycolytic enzymes as antigens. Fructose can affect brain derived neurotrophic growth factor function producing neuropsychiatric syndromes. 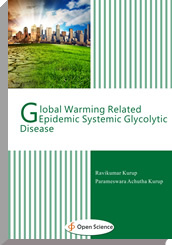 This can be collectively called as global warming related glycolytic disease or Lemurian syndrome.